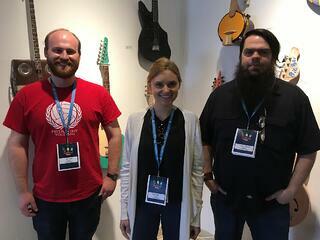 The Page One Web Development Team recently attended WordCamp Maine, a local conference that covers everything related to WordPress. WordPress is a free, open source content publishing software that powers over 100 million website on the internet. WordCamp Maine is great for anyone who loves to use, build, write, and create with WordPress. In general, this year's topics focused on practical takeaways that attendees were able to put into action as soon as they returned to work. Andy Gagnon's (@andygagnon) presentation about WP-CLI, which I found particularly illuminating, shared about reducing setup and deployment times for development sites. WP-CLI is a set of command-line tools that are currently available via http://wp-cli.org, but will soon be included in the WP REST API. With simple commands, you can use WP-CLI to download the newest version of WordPress, set up a database, remove widgets, download and activate themes, and even backup files and databases. With these tools, setting up a development site can be completed in a fraction of the time it would take to use the GUIs for cPanel/Plesk, phpMyAdmin, and WordPress itself. So productive! For me, one of the more meaningful talks came in the form of Sam Hotchkiss' (@HotchkissWeb) discussion of the development and marketing of WordPress plugins. Page One has been developing our own WP plugins for internal use for a while now, but we have yet to dip our toes into the world of making our plugins available via the public WordPress repository. Sam pointed out that once you release your creations into the world, you're on the line as far as making sure they're secure, updated regularly, and that they work with as many random mixtures of other plugins and versions of code that users are running as possible. It can be a full time job in and of itself. After all, a recent article revealed that a large percentage of hacked WordPress sites can be attributed to outdated plugins. 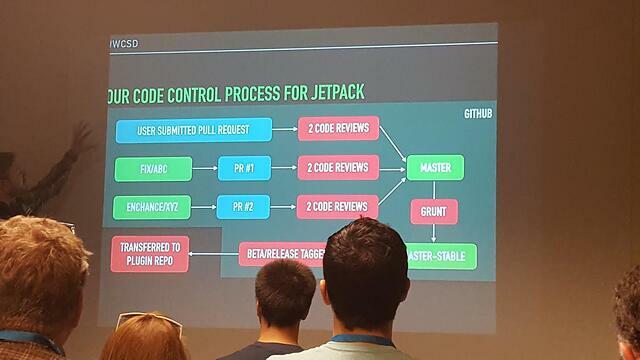 During his lecture, Sam shared the development and review workflow for Automattic's Jetpack plugin suite, and it illustrates just how much work goes into releasing new versions of their product. Hotchkiss admitted that before this comprehensive plan was in place, there were things that they would miss in their code before pushing it live (See photo below). Sam was nice enough to make his slidedeck available here. Page One was proud to have been a sponsor for this year's WordCamp Maine event. We're excited to see more and more people using the CMS for business and for fun. It's always great to meet up with other developers who are creating in WordPress too. We are already looking forward to next year!